For legal reasons, use a login banner to tell any potential hacker that you shouldn’t be doing this! Generating 1024 bit RSA keys! Define realistic expectations with your client! Security doesn’t protect FOREVER. Document an agreement and timeframe. Even with Auto Secure/One Step Lockdown, Cisco doesn’t guarantee security, but they have done everything they can. Create a definitive security policy. Put in writing what will and wont be allowed. What actions will be performed when undesirable behaviour takes place? Create an incident response plan. Have a plan in place to handle it and ensure updates as time goes by. Securing Our Switches: MAC Address Flooding,VLAN Hopping,CDP,Telnet and SSH. A MAC Address Flooding attack is an attempt by a network intruder to overwhelm the switch memory reserved for maintenance of the MAC address table. The intruder generates a large number of frames with different source MAC addresses – all of them invalid. As the switch’s MAC address table capabilities are exhausted, valid entries cannot be made – and this results in those valid frames being broadcast instead of unicast. As mentioned, the MAC address table fills to capacity, preventing legitimate entries from being made. The intruder can easily intercept packets with a packet sniffer, since the unnecessarily broadcasted packets will be sent out every port on the switch – including the port the intruder is using. You can combat MAC Address Flooding with two of the features we addresses earlier in this section – port-based authentication and port security. Switch Hopping – A rogue host connected to a port in Auto trunking mode, can pretend it is a switch and send DTP frames of it’s own, leading to a trunk being formed to the rogue host. Best practice is to disable CDP to all ports that don’t need it! Only links to other Cisco devices. (IP Phones are a interesting case). CDP is sent in plain text and contains information about your network. LLDP – Link Layer Discovery Protocol – Other vendors equivalent to CDP. Specify your transport input method as ssh, telnet or all! Setup an ACL and protect your VTY ports with it. Author drbabbersPosted on May 4, 2013 May 5, 2013 Categories CCNP Revision, SecurityTags cdp, mac address flooding, ssh, telnet, vlan hoppingLeave a comment on Securing Our Switches: MAC Address Flooding,VLAN Hopping,CDP,Telnet and SSH. DHCP Snooping allows the switch to serve as a firewall between hosts and untrusted DHCP servers. DHCP Snooping classifies interfaces on the switch into one of two categories – trusted and untrusted. DHCP messages received on trusted interfaces will be allowed to pass through the switch. Not only will DHCP messages received on untrusted interfaces be dropped by the switch, the interface itself will be placed into err-disabled state. DHCP Snooping is verified with the show ip dhcp snooping command. Note the “rate limit” for the untrusted port is set to “unlimited”. That rate limit refers to the number of DHCP packets the interface can accept in one second (packets per second). Just as we must protect against rogue DHCP servers, we have to be wary of rogue ARP users as well. Enabling Dynamic ARP Inspection (DAI) prevents this behavior by building a database of trusted MAC-IP address mappings. This database is the same database that is built by the DHCP Snooping process, and static ARP configurations can be used by DAI as well. DAI uses the concept of trusted and untrusted ports, just as DHCP Snooping does. However, untrusted ports in DAI do not automatically drop ARP Requests and Replies. Once the IP-MAC address database is built, every single ARP Request and ARP Reply received on an untrusted interface is examined. If the ARP message has an approved MAC-IP address mapping, the message is forwarded appropriately; if not, the ARP message is dropped. If the interface has been configured as trusted, DAI allows the ARP message to pass through without checking the database of trusted mappings. DAI is performed as ARP messages are received, not transmitted. Cisco’s recommended trusted/untrusted port configuration is to have all ports connected to hosts run as untrusted and all ports connected to switches as trusted. We can use IP Source Guard to prevent a host on the network from using another host’s IP address. IP Source Guard works in tandem with DHCP Snooping, and uses the DHCP Snooping database to carry out this operation. The switch will then dynamically create an VLAN ACL (VACL) that will only allow traffic with the corresponding source IP address to be processed by the switch. This IP address-to-port mapping process is called binding. To enable IP Source Guard, use the ip verify source vlan command on the appropriate interfaces once DHCP snooping has been enabled with ip dhcp snooping. There is no penalty for hitting the limit of secure addresses – it just means the switch can’t learn any more secure addresses. Note that “aging time” is set to zero – that actually means that secure MAC addresses on this port will never age out, not that they have zero minutes before aging out. Port security is good, but we can take it a step further with dot1x port based authentication. The name refers to IEEE 802.1x, the standard upon which this feature is based. Unusually enough, the Cisco authentication server must be RADIUS – you can’t use TACACS or TACACS+. One major difference between dot1x port-based authentication and port security is that both the host and switch port must be configured for 802.1x EAPOL (Extensible Authentication Protocol over LANs). That’s a major departure from many of the switch features we’ve studied to date, since most other switch features don’t require anything of the host. Usually the PC isn’t aware of what the switch is doing, and doesn’t need to know. Not this time! By default, once the user authenticates, all traffic can be received and transmitted through this port. SW2(config)#aaa authentication dot1x default ? run dot1x authentication must be configured as well. Force-authorized, the default, does just what it sounds like – it forces the port to authorize any host attempting to use the port, but authentication is not required. Basically, there is no authentication on this port type. A port in force-unauthorized state literally has the port unable to authorize any client – even clients who could otherwise successfully authenticate! The auto setting enables dot1x on the port, which will begin the process as unauthorized. Only the necessary EAPOL frames will be sent and received while the port’s unauthorized. Once the authentication is complete, normal transmission and receiving can begin. Not surprisingly, this is the most common setting. The versions are much the same, though; the real difference comes in when you define the source ports. It’s the location of the source ports that determines the SPAN version that needs to run on the switch. Local SPAN, since the destination and source ports are all on the same switch. 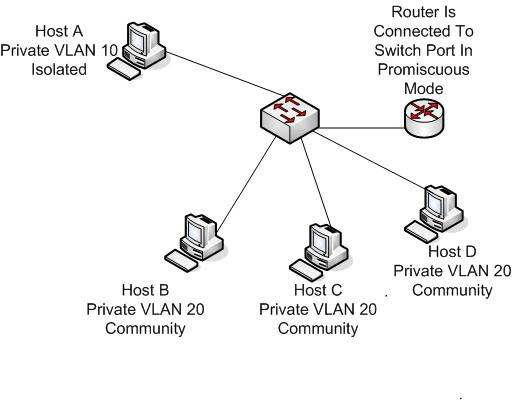 If the source was a VLAN rather than a collection of physical ports, VLAN-based SPAN (VSPAN) would be in effect. Different privilege levels – not every user needs the same level of access to potentially destructive commands, because not every user can handle the responsibility. Cisco switches have more VTY lines than routers. Routers allow up to five simultaneous Telnet sessions, and obviously switches allow more! The username / password command allows the assignment of privilege levels. If none is specified, level 0 is the default. Here’s another basic security feature that’s regularly overlooked, but is very powerful. Port security uses a host’s MAC address as a password and if the port receiving this frame is running port security and expects frames with that particular MAC address only, frames from this host would be accepted. Port security can’t be configured on a port that even has a possibility of becoming a trunk port. The default port security mode is shutdown, and it’s just what it sounds like – the port is placed into error-disabled state and manual intervention is needed to reopen the port. An SNMP trap message is also generated. Protect mode simply drops the offending frames. Restrict mode is our middle ground – this mode drops the offending frames and will generate both an SNMP trap notification and syslog message regarding the violation, but the port does not go into err-disabled state.